The replica of Fort William Henry at the Colonial Pemaquid State Historic Site. BRISTOL, Maine — Although the Maine Legislature has voted against authorizing a nonprofit to lease the Colonial Pemaquid State Historic Site, the organization’s leader said he will continue to pursue the possibility. Sen. Dana Dow, R-Waldoboro, sponsored LD 1739, Resolve, Authorizing the Lease of the Colonial Pemaquid State Historic Site, which would have authorized the director of the Maine Bureau of Parks and Lands to lease the site to The Friends of Colonial Pemaquid. Rep. Mick Devin, D-Newcastle, co-sponsored the bill, along with Sen. Paul Davis, R-Sangerville, and Sen. James Dill, D-Old Town. 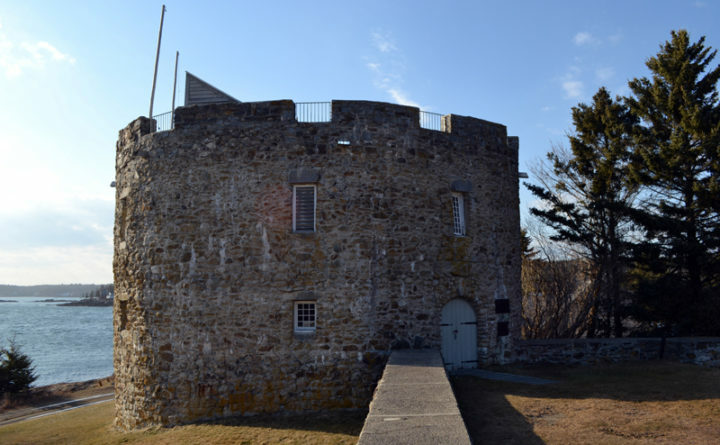 The bill was the nonprofit’s most recent attempt to secure a lease for the historic site, which includes a replica of Fort William Henry, a fort house, and a museum dedicated to the history of Pemaquid. The nonprofit has been pursuing a lease since at least January 2016, when its leaders met with Gov. Paul LePage. Currently, the Bureau of Parks and Public Lands, part of the Maine Department of Agriculture, Conservation, and Forestry, owns and manages the site with support from The Friends of Colonial Pemaquid. Under a proposed lease agreement, the nonprofit would take on the responsibility of operating and maintaining the site. Similar arrangements exist throughout Maine, including at Fort Knox and Penobscot Narrows Observatory. The nonprofit sees three major benefits a lease would provide the site and the local area: the creation of an “economic engine” for the peninsula, the development of a vibrant educational destination, and the revitalization of plans to build a replica 17th-century village. After meeting with the governor, The Friends of Colonial Pemaquid entered negotiations with the state for the lease. The conversation stalled due to a disagreement between the nonprofit and the state regarding lease payments from The Contented Sole, a restaurant on the property, as well as issues with a “citizen support agreement” the nonprofit would have had to sign. In an effort to restart negotiations, Loprieno and board member and former site manager Barry Masterson collected letters from area businesses and town officials in the fall of 2016 and sent them to LePage to demonstrate local support for the lease agreement. He also had concerns about changes the nonprofit made to the draft citizen support agreement and said it was “inappropriate” for the organization to spend time asking businesses and organizations for letters of support. After receiving the governor’s letter, The Friends of Colonial Pemaquid began to seek out other options to obtain the lease, including speaking with Dow and Devin. During a hearing for the bill before the Committee on Agriculture, Conservation, and Forestry on Jan. 16, Loprieno, Dow, and Lincoln County Board of Commissioners Chair Hamilton Meserve testified in support of the bill and a lease agreement. The Friends of Colonial Pemaquid also provided letters of support for the bill from the towns of Bristol and Damariscotta, as well as the Damariscotta Region Chamber of Commerce and local residents. However, the bill received strong opposition from Tom Desjardin, the director of the Bureau of Parks and Lands. In his statement to the committee, Desjardin said the bill was “unnecessary,” as the bureau already allows private groups to manage state facilities. The “overwhelming issue” at Colonial Pemaquid, Desjardin said, is the annual cost of managing the site. On average, the net cost of operating the site is about $40,000, which “is not a sum that a nonprofit can reasonably raise annually for operating costs alone,” Desjardin said. During the 2017 season, the site hosted 55,694 visits and had a net loss of $67,369, he said. The Friends of Colonial Pemaquid “has not demonstrated the capacity to raise the necessary funds each year” to overcome the losses, Desjardin said. Others in opposition to the bill included Mary Anne Turowski, director of politics and legislation for the Maine State Employees Association, Service Employees International Union Local 1989, who expressed concern about layoffs of state workers who operate and maintain the site and restrictions on public access to the site via a Maine State Park Pass. Representing Maine Audubon, Eliza Donoghue expressed concern that passage of the bill would “set a poor precedent and lead to entities with less experience and resources than the Maine Bureau of Parks and Lands” managing state parks. After a work session Jan. 30, a majority of committee members voted that the bill ought not to pass. Only Davis, the Senate chairman of the committee, voted it ought to pass with amendments. The Maine Senate received and accepted the committee’s report Feb. 15. On Feb. 20, the Maine House of Representatives also accepted the report that the bill ought not to pass.